The Pressurized Growler Keg from GrowlerWerks acts like a mini pressurized keg, complete with tap for an easy pour. It’s made by beer lovers to help folks like them enjoy fresh-tasting craft beer at home. An integrated CO2 system in the growler keeps beer carbonated for up to two weeks after you fill it—you can set the pressure you want by turning the dial. A carbon dioxide regulator cap holds CO2 inside and keeps oxygen out. Beer on the go stays cold thanks to double-wall, vacuum-insulated stainless steel, and an external pressure gauge and sight glass help you stay on top of what’s going on inside. Dimensions: 64 oz. : 5.2" x 8.2" x 10.9"; 128 oz. : 11" x 9" x 14.5"
Weight: 64 oz. Growler: 4.5 lbs. ; 128 oz. Growler: 6.8 lbs. Great gift. He loved it. Just in time for Christmas and the fresh batch he was brewing. The GrowlerWerks Pressurized Growler Keg is a beer lover’s dream come true. The pressurized growler was made by beer fans and engineers Shawn Huff, Evan Rege, and Brian Sonnichsen, who all wanted to make the beer-drinking experience better for folks like them. They created a way to keep beer tasting straight-from-the-tap fresh after you leave the brewery. 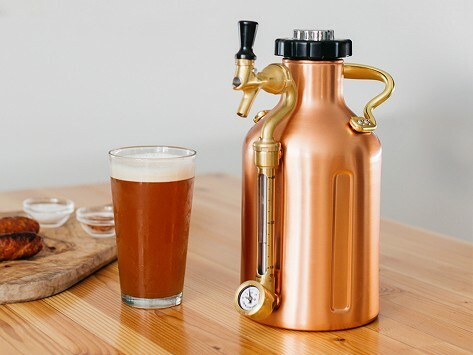 The pressurized growler has an industrial vibe and acts like a mini keg, thanks to a built-in CO2 system that can keep beer carbonated for up to two weeks. You can set the pressure you want and keep an eye on it thanks to an external pressure gauge. Taking that beer to a party? Double-wall, vacuum-insulated stainless steel keeps it cold and a sight glass lets you know when it’s time to refill.